Forgive my exuberance, but I went to Clemson for both undergraduate and graduate school, and after being there during the glorious 1981-1982 National Championship season, it has been 34 years of non-stop heartache. They've been good, and at times excellent, but they've never come close to repeating that one, unforgettable accomplishment. Supposedly, "to keep players' focus on football as opposed to the outside world." I read it more as, "to keep any stars from getting trashed at 2 AM and tweeting something stupid." Can you imagine completely giving up social media for four months in this day and age when you're in college? This is the 21st-century version of saltpeter. Clemson has a 30+ year history of breaking my heart. I wouldn't be writing this if I were confident enough to believe that this isn't all just a dream, and that my dream will once again be shattered - probably not in the next three weeks, but either in the ACC Championship Game (against North Carolina), or in the BCS (as long as they make it to the BCS, I'll be a happy guy even if they lose in the semis or finals). Just please, Clemson, no losses to Syracuse, Wake Forest, or South Carolina, okay? I think this time it might be for real, but please don't hurt me again - I'm not getting any younger, and the memories of the 1981-1982 National Championship are fading as the years and decades fly by. Clemson has been a nearly perennial Top 10-20 team, and let me tell you, the difference in attention between that, and being ranked #1, is incomparable - the entire nation is actually *respecting* Clemson right now, and that's something I haven't seen since the Orange Bowl on Jan 1, 1982.
with an "s" sound; not 'CLEMzon with a "z" sound, and not 'CLEMPson either. I have literally heard dozens, more likely hundreds, of people mispronounce the name in the past 35 years, and I'll stand for it no longer. I get it - Clemson is Cow College, it's in Pickens County, it's a day trip to visit Ninety-Six, SC, Gumlog, GA, Shooting Creek, NC, and Ducktown, TN - all of them in one day - *but* Clemson is now a legitimate national football power, so buck up your diction! Thank you for listening, and have a nice day. Don, if only I cared as much about Alabama football as I am supposed to, we could have a real bet. If Alabama was ever ripe for an upset, it's now - Clemson has peaked at the right moment. That said? I can easily see Alabama winning by 21 points; I absolutely cannot see Clemson winning by 21 points. Nobody in the country scares me more than Nick Saban. * Clemson has slightly better all-around talent than Alabama. * Clemson has the best quarterback in the nation in Deshaun Watson, and Alabama is starting a true freshman. * Alabama *just* lost their Offensive Coordinator Lane Kiffin in the past week. * Clemson's best receiver, Mike Williams - an NFL first-round pick in the upcoming draft - is playing this year, and didn't play last year. * Nick Saban may be the greatest coach in college football history; Dabo Swinney may be the second-best coach in the country. 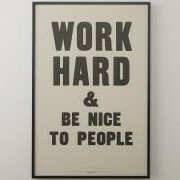 1) Will talent and hunger be able to defeat experience and moxie? 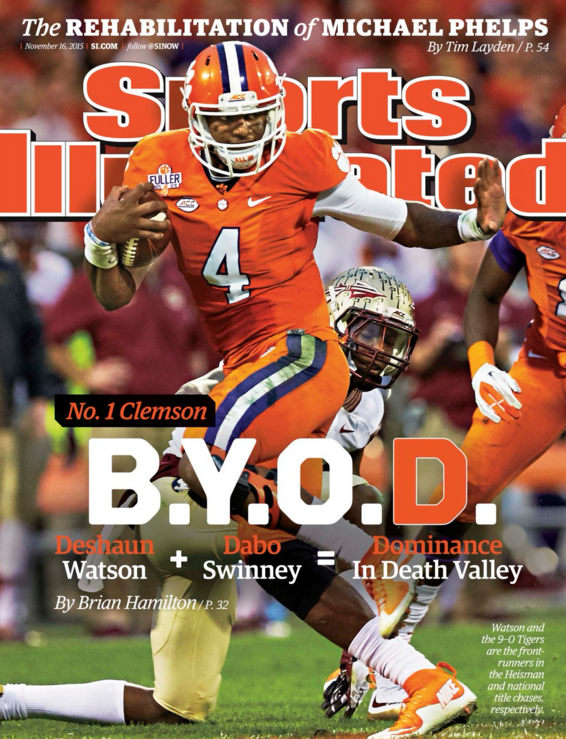 At some point, it does, but you have to make a quantum leap to do it, and Clemson has yet to make that quantum leap. Winning national championships at Alabama is becoming something of a routine. This year *might* be the year that Clemson breaks through and takes it all, but do you *really* want to bet against Nick Saban and a proven winner in Alabama? 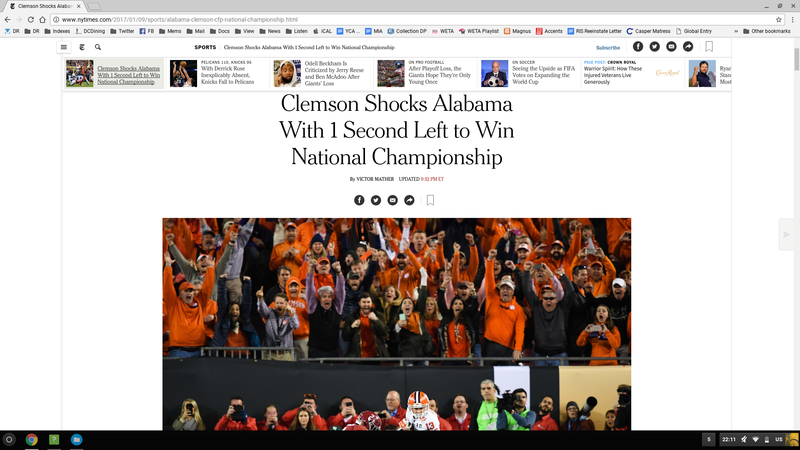 2) If someone looked into the future, and told me that the winning team was going to win by 21 points or more, I'd bet almost anything that the winning team would be Alabama: I simply cannot imagine Clemson beating Alabama by 21 points, but I can easily see Alabama beating Clemson by 21 points. It all depends if Clemson can put together four quarters of sustained excellence against a proven champion. 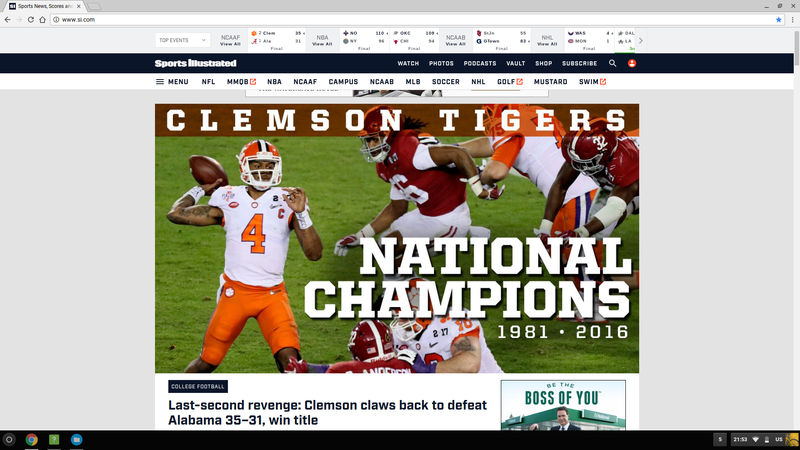 At some point in time, *someone* is going to do it, and Clemson appears to be as ready right now as anyone could possibly be. Do I predict that Clemson will win? 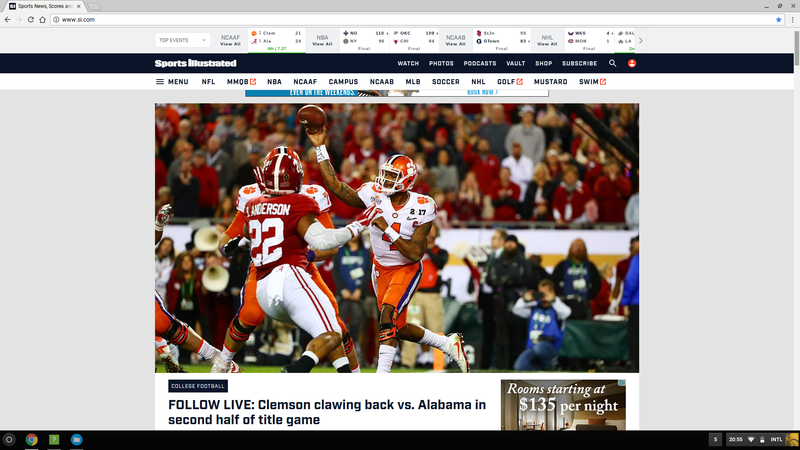 No, I just can't bring myself to do it - I'm going with Alabama, and it might be close, and it also might be a blowout; if I'm wrong, and Clemson wins, I think it's going to be close. Winners tend to win, and Clemson just hasn't done it yet (at least, not since 1981-1982). I hate myself for what I just typed. Ironically, if I was neutral, instead of being a Clemson graduate and lifelong fan? I might pick Clemson, but I cannot bear to get my hopes up, only to have them shat on by the football Gods, and I'd rather have a nice surprise than a bitter disappointment. In other words, this post means absolutely nothing, and is devoid of credibility. I will Clemson to win. This is my first time watching. If Clemson wins, I hope to see you on the 25th! There are worse things in life than playing Alabama to a near-draw. I've waited 35 years for this. The next day, this hasn't sunk in *at all* - people don't realize how long 35 years is to wait ... 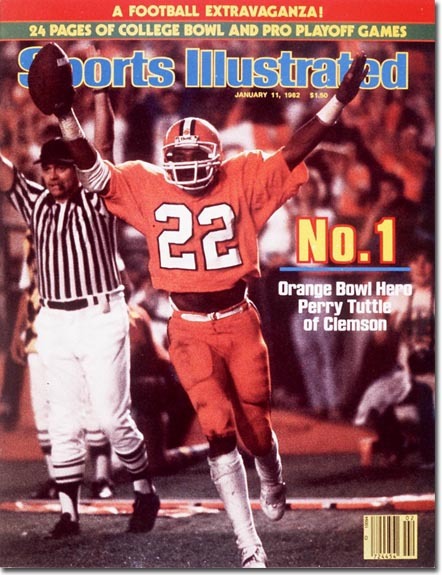 I was a Junior at Clemson when they beat Nebraska in the 1981-1982 Orange Bowl. I don't mean to pile on with these articles; I just want to record them for future reference because they'll be harder to find later. Congrats Don (and obviously to Clemson)! That was one hell of a game. Well, Clemson indeed won in a nail-biter. I think it's good for college football that Alabama didn't win. Congrats to Clemson, congrats to their fans (uh Don, are you part of this pack?). Good game, though I must admit fell asleep, due to my age, and having watched the NFL on Sunday). So sorry I missed the climactic finale. Don: I realized I know another person who should have exulted with this victory; in fact he played for Clemson deep in the past; would have been the 60's. His then coach, the legendary Frank Howard, called him long boy...as he was probably 6 7' or 6 8' at the time and was a receiver/punter. I do recall how he repeated how coach Howard described him, which went something like..."....long boy, I've seen/coached a lot of boys in my day and you are the longest boy I've ever coached". Anyway this guy has been one of my brother's life long friends, and for years he received tickets to Dallas Cowboy football games from his ex Clemson teammate Charley Waters, who still sits in some Clemson record books. So I know Gary and I suspect my brother went to some Dallas Cowboy games thanks to the connection to the Clemson Tigers. What a game and what an ending. So sorry I fell asleep. 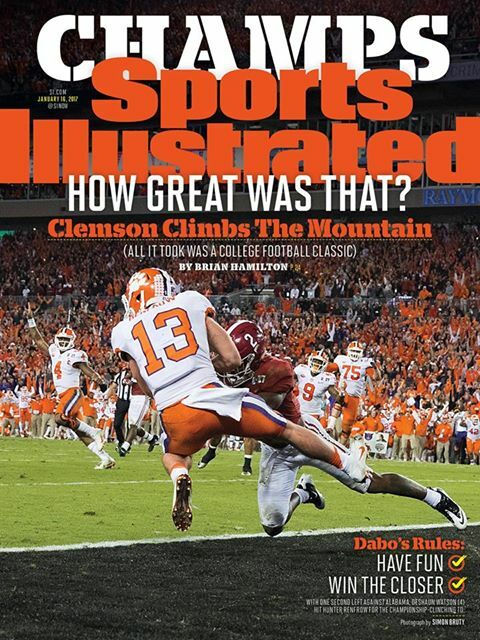 I'm sure Clemson fans will hold on to this one for a long time....and you all should!!!! Hunter Johnson is a true freshman who, by ESPN's rating system, was rated as the #1 pocket-passing quarterback in the country in 2017; yet, he's currently the 3rd-string quarterback for Clemson. From what little I'd seen of him, I thought sure he should be the starting quarterback for Clemson this year, but that job went to Kelly Bryant, the #10-rated dual threat QB in 2015 (while the backup job has gone to Zerrick Cooper, the #9-rated pocket-passing QB in 2016). After Kelly Bryant twisted his ankle today, Cooper came in for a couple of series, and was ineffective, going 2-6 for 16 yards, both series being 3-and-out. After that, Johnson came in, and went 5-5 for 42 yards and 1 touchdown - I *really* hope that he's given some consideration as the starting quarterback going forward. One reason for this is because Johnson is a pro-style quarterback, and Kelly Bryant is basically a running back who's playing quarterback - he has very little chance to make it in the NFL as a QB. Clemson came out early this season using a spread offense, which utilizes Bryant's skills to the max; for whatever reason, beginning with Boston College (game #4), Clemson completely changed their offensive attack - for the past three games, they've switched to more of an NFL-style, smash-mouth running game which I think is more suited to Hunter Johnson than Kelly Bryant. Clemson is averaging over 100 more rushing yards this season than last (when they were under the leadership of Deshaun Watson (the #1 dual-threat quarterback in 2014)). To summarize this, ESPN has two different "categories" of quarterback - those they deem to be a "Pocket Passer," and those they deem to be a "Dual Threat." Extreme examples of both would be Tom Brady and Randall Cunningham. For Clemson, the above history is summarized as follows (incredibly, if you peruse the lists, they had more than these, who must have ended up transferring or vanishing into thin air). I'm guessing - and it's only an educated guess - that they decided to change up their style of offense before the Boston College game this season to prepare for the upcoming days of Hunter Johnson and Trevor Lawrence, both of whom are *great* all-around quarterbacks; neither of whom will set records in the NFL combine. Notice that they've gotten a Top 10 (in one category or the other) for the past five years. Watson was The Man, now it's Bryant, with Cooper as backup. It almost seems like they're getting one great QB a year, and they're letting that quarterback step up and have a chance. I don't mean to disrespect Bryant or Cooper, but Hunter Johnson is the best of what they have right now, and both he and Trevor Lawrence will be the best 1-2 punch in the country if neither gets injured or transfers. Clemson is known for their ferocious defensive line, but they've snuck up on everybody when it comes to recruiting pro-style quarterbacks - now, they need to recruit great offensive linemen, tight ends, wide receivers, etc. And special teams. Don't forget about special teams! Syracuse deserved it - they came out with unbridled fury, and played to win. They ran a no-huddle offense the entire game, and caught Clemson's defense completely off-guard. The truth is that Clemson's best quarterback, IMO, is playing third-string, and their starting quarterback twisted an ankle in the second quarter and sat out the entire second half - Clemson chose to play their backup (Zerrick Cooper), who I think is a very poor choice. Also, they lost their field-goal kicker for the season a few weeks ago, leaving their special teams in a shambles. Their backup kicker, Alex Spence, missed FGs from 35 and 38 yards, and simply isn't good enough to play at this level (he's a 4.0 student, and won't have any trouble finding a job after his college career is over). Unlike, for example, quarterback, great college teams generally don't have more than one great kicker - they almost never get injured, and no good high-school kicker wants to ride the bench for their entire career: It doesn't matter if they play for Alabama, or George Mason - they just want to play and be noticed. Clemson's first-string kicker, two-time All-ACC Greg Huegel, got injured in an unlikely practice situation, and is out for the season. Clemson's special teams are below average, and that right there is enough to kill a top-level team. 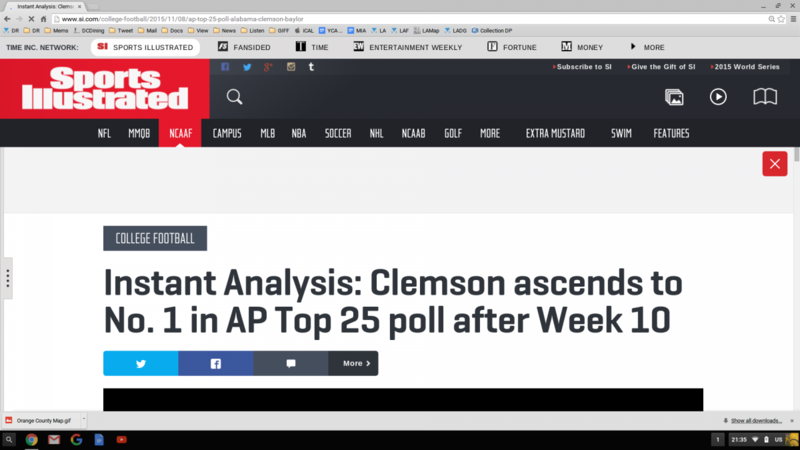 Obviously, I'm a huge Clemson fan, but I'm also a realist: In order to reach the playoffs this year, Clemson must win out, and hope for a little help from the Football Gods (which they'll probably get). However, due to their unsettled quarterback situation, and their desperate situation with special teams, I don't expect them to win the rest of their games. They could have done it if they were healthy, but they aren't healthy, and being healthy is every bit as important as having, for example, a great defensive line - it's part of the game. All this to repeat my first sentence: Syracuse was the better team Friday night. "The trend is clear: Most elite high school QBs think they’re going to beat out whoever is front of them."" If you're good enough to be considered one of, if not the best quarterback in HS, you don't think about losing a competition. Call it hubris or naivete or that alpha dog mentality so treasured in football, but these guys only see themselves as competition. If I grew up loving Clemson and Clemson loves me, and I've outperformed every other quarterback I've ever been put up against, I'm not going to my second choice because somebody else with a high star ranking is already there. Of course, as anyone who follows college football regularly can tell you, there are plenty of times that these highly ranked recruits turn out to be not that good. Especially at quarterback. So an abundance of riches ends up being one viable starter. That reminds me of USC's 2006-2007 recruiting classes, at the height of the Carroll dynasty. In 2006 they signed four of the top 13 running backs in the class. In 2007 they signed the top 1 and 2 running backs in the class, the former being the number one overall player in the country. None of them turned into an All-American, a few transferred out, only one was drafted by the NFL and at the end of their careers it just turned into the familiar recruiting tale that the next big thing may never come -- even if you have a bunch of them. Even though as an Ohio State fan, I am honor-bound to hate Wisconsin, I am not certain why they are not getting more love in the polls. They only played one Top 25 team - it's all moot, because Wisconsin is in, and if they win out, they're national champs.